It’s Super Bowl season!! Patriots vs. the Rams … Who are you rooting for? 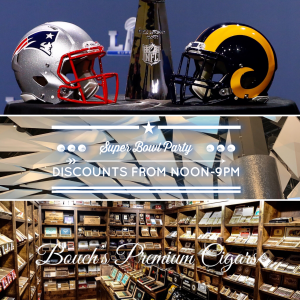 Whatever your side, be sure to go to Bouch’s for your game day cigars. The Special Football Edition Factory Press, comes in 10-count boxes for $16 a stick and $160 a box. Only 450 boxes were released nationwide and we have 4. The 2019 La Flor Dominicana Special Football Edition (Factory Press) measures 6 1/2 inches by 58 ring gauge and is, like the name implies, sharply pressed. It’s rolled with Dominican filler tobaccos and a Dominican binder, covered by Ecuadoran Habano wrapper. To drive home the theme, the cigar includes a football design on its wrapper made out of Connecticut Shade, as well as stripes on the head and foot that resemble the laces of a football. Call 251.517.9526, thank you LFD for this perfect complement to game day! © 2018 Bouch's. All Rights Reserved. Designed by Next Level Studio.